What Are the Benefits of Geraniums? Geraniums are flowering perennial shrubs. They offer the benefits of low maintenance, versatile growth habits, wide color selection and simple propagation, according to David Rodriguez, a horticulturist at Texas A&M University. You can plant geraniums in ordinary, well-drained soil. They are non-fussy plants, with a preference for dry soil, minimal fertilizer and full sun exposure. 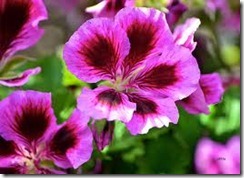 You can use geraniums as ground cover or for containers. Horticulturist Rodriquez notes that the plants thrive when root-bound. This benefits the gardener who needs a fast-growing container plant requiring no re-potting. You can match geraniums with any color scheme. The flowers offer wide ranges of cream, pink or maroon shades. Ruffled geranium foliage varies from lime-green leaves to dark two-toned leaves edged in green and dusky colors. You can easily root geraniums from cuttings. All you need to do is cut off stem tips from 3 to 5 inches long. Remove the lower stem leaves and insert the cutting about one-third of its length into potting soil. Fertilize when new growth appears. Geraniums can be grown as perennials in mild climates or as annuals in all climates. The scented flowers and full foliage transplant easily for indoor winter pots.